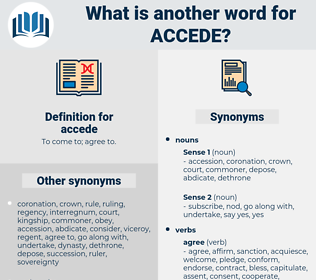 What is another word for accede? To come to; agree to. withdrawing from agreement or statement. continued, Parties, subscribe, access, accept, embrace, enter, participate, abide, belong, rejoin, endorse, agree, ratify, accommodate, enrol, sign, navigate, opt, proceed, comply, accession, respond, become, stick, consent, associate, espouse, grant, approve. deny, disagree, hold, demur, hinder, obstruct, dispute, disallow, forbid, impede, veto, reject, resist, protest, decline, denounce, repel, dissent, condemn, repudiate, oppose, keep, disapprove, refuse, prevent. contradict, contend, rebuff, differ, scorn, gainsay. Well, he said at length, if that is the case, I need not expect you to accede to my proposals. The Estates of the province were as conservative as the city of Utrecht itself was ultra - democratic; and a long series of disturbances were caused by the burgher - regents of the Town Council refusing to accede to the popular demand for a drastic change in their constitution. augite, axe head, Azo Dye, actaea, agitate, aghast, associate, Agua Toad, agate, asat, ascot, associated, aught, acid head, asset, august 15, act out, as yet, ax head, accused, ague weed, ask out, agitated, assist, acheta, aside, aesthete, actuated, azido, acetate, august 6, aikido, acaudate, acute, acid, acuate, assisted, acquit, aged, azide, acid dye, azt, aguacate, acuity, axseed, acidity, access code, agouti, actuate, agueweed, 15 August 1945, azote, acquitted, august, assiduity, Asadha, august 1, acadia, augusta, astute, act, acth, accost, acedia. give in, yield, buckle under, knuckle under, succumb. come after, succeed, take office, follow.